Sequels are always better than the original aren’t they? Aliens is much better than Alien. Terminator 2 is much better than The Terminator. Speed 2: Cruise Control is much better than… oh. OK so sequels aren’t always better than the original but when it comes to the service model canvas, the updated version undoubtedly is. Having had the opportunity to run some more service model canvas workshops and having garnered the sorts of questions and queries that kept coming up I’ve updated the canvas. I’ll run through the updates and also answer some of the frequent questions. 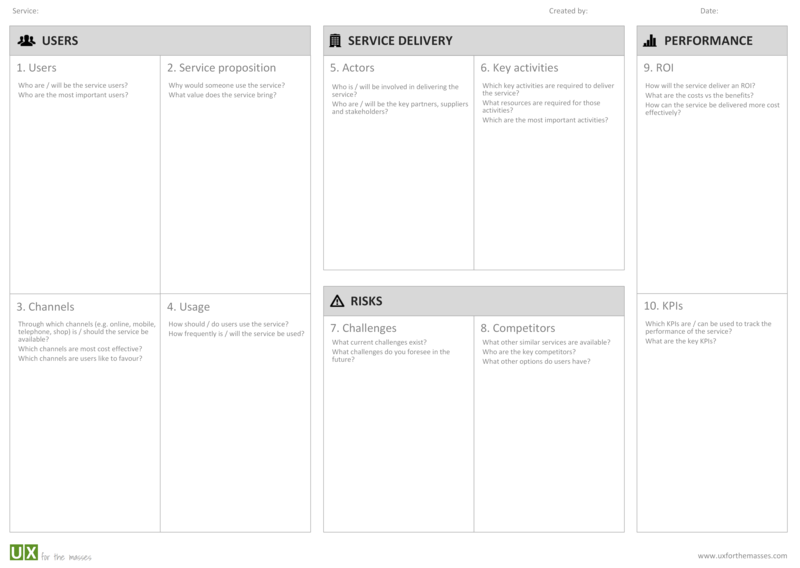 Don’t worry if you’re not familiar with the service model canvas as I’ll also run through how to fill the canvas out, when to use it and answer some frequently asked questions. As a UX designer, I find myself thinking more and more about services these days. I find myself thinking about where a particular app, website or product fits into a wider service and how designing a great user experience is not just about getting the small stuff right, like the UI, but also the bigger stuff. Services are complex, and I’ve found it difficult to know where to start when it comes to exploring and de-constructing an existing service, or indeed thinking about a new service. 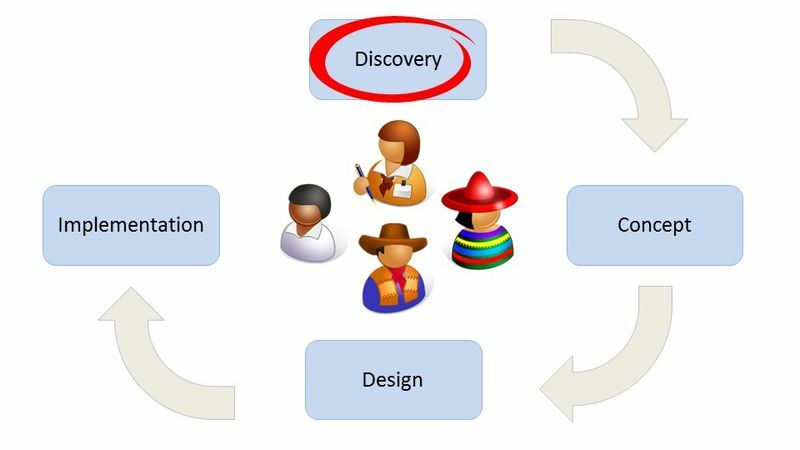 In my search for help with this problem I came across the excellent Business Model Canvas – a tool for developing and documenting business models. Inspired by the Business Model Canvas I created the Service Model Canvas (see what I’ve done) to help develop and document not business models, but service models. This is the second version of the service model canvas. You can find out details of the previous version and also view a tutorial for the previous version of the service model canvas. Related boxes are now grouped together to. There’s a ‘Users’ group for information relating to service users; a ‘Service delivery’ group for information relating to delivering a service; a ‘Risks’ group for, well risks and a ‘Performance’ group for information related to how the service is performing. Boxes are now numbered to show a suggested order of entry. “Is there an order I should use?” was a frequent question and whilst strictly speaking you can fill out the canvas in any order you want, I think that including a suggested order helps to structure the discussions about the service. The ‘Costs’ box has been removed. I found that people were not sure if service delivery costs should go in the ‘ROI’, or the ‘Costs’ box and were spending a lot of time trying to think of every possible cost, no matter how small. I’ve therefore removed the ‘Costs’ box as it made sense to consider and capture ROI and costs together. The ‘Key resources’ box has been removed. I found that key resources were discussed as part of key activities (i.e. something is required to do this activity) so it made sense to include key resources as part of the key activities box. 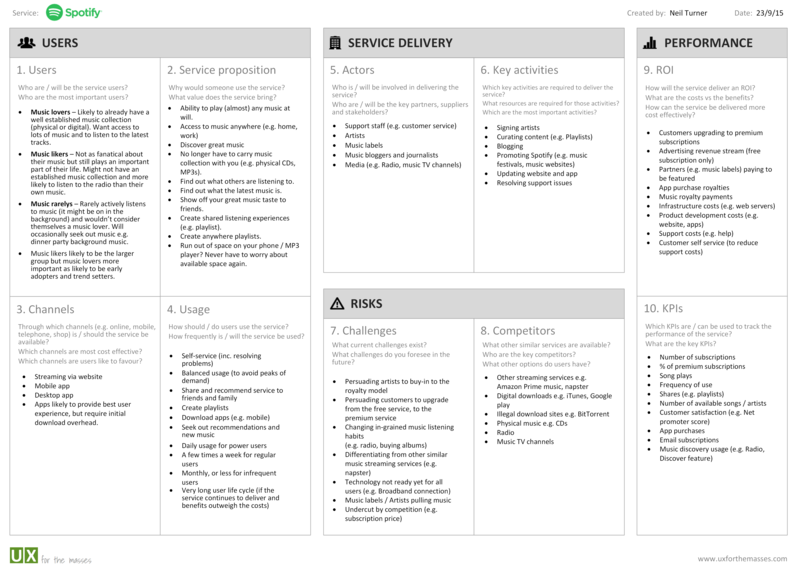 The updated version of the service model canvas is show below. 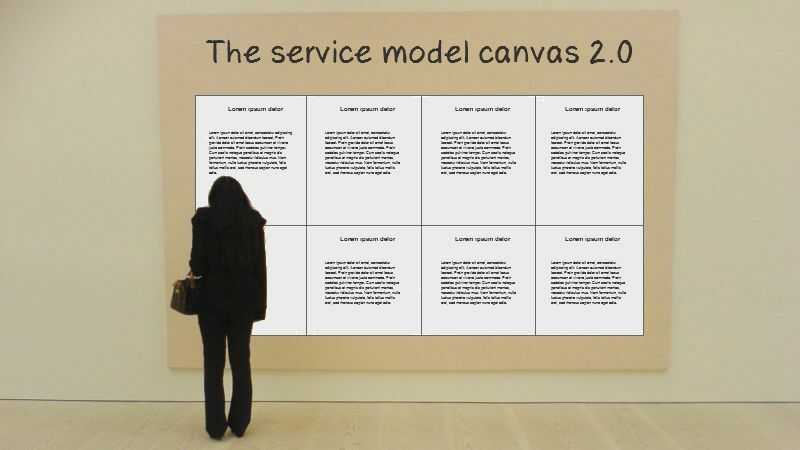 The Service Model Canvas asks a number of questions about the service, such as who are the users? Why would someone use the service in the first place? What competition and alternatives are out there? The canvas is not intended to capture every detail about a service, only the high level details. It’s primary role is really to help frame the discussion and as a useful set of thought starter questions. I’ve created an example for Spotify (the music streaming service) to hopefully show the sort of information you might capture. Each section of the canvas has a set of thought starter questions that will help to kick things off. I’d recommend going through each section in turn (a suggested order is shown, but feel free to use whatever order you like) to help capture the high level details about the service. Don’t worry about capturing every detail, just the key ones and if you don’t know enough about something at this stage, or don’t think that it’s relevant, simply leave it for now. Don’t be afraid to leave a box blank but if you do find yourself making lots of assumptions then be sure to mark these (for example with a highlighter, or using a different colour) so that you can come back to validate these assumptions later on. I’d recommend that you fill out the canvas as a small group, or fill it out yourself and then go through with others to check and validate your answers (especially if there are lots of assumptions). If you’re filling out the canvas on your own it’s likely to take less than an hour to fill out for most services (more for complex or very conceptual services). Factor in more like half a day for a group. If you’re filling the canvas out as a group then it’s a good idea to print out a large version to go through. You’ll find there are 2×2 and 3×3 poster versions of the canvas (courtesy of the excellent PosteRazor) available at the end of the article. If you need to fill out the canvas on-screen (for example others are remotely joining the meeting) then I can recommend the splendid mural.ly to create, store and share a digital version of the canvas. I’ve found the service model canvas to be most useful during the early exploration of a potential new service or of an existing service. It helps to explore questions such as, what are the most important design considerations? What are the key design challenges? What can we improve the current service? It’s also a good tool for considering the wider service for a particular user touch point, such as a website or app. For example, given that we’ve been asked to redesign a website, how does that website fit in to the wider service? The service model canvas is not intended to be a comprehensive list of everything you need to think about and document when designing, or improving an existing service. Instead, think of it more like a set of service design thought starter questions. It will hopefully initiate some of the conversations and debates necessary to start you on that long journey to designing a truly excellent service for your users. Obviously a very key piece of information for any service is who the users are. For new services, think about who you expect to use the service? Also, are there any distinct user groups? For example, enthusiasts, as opposed to very occasional users. What are the different characteristics of these groups? Who are the most important users? Designing a fantastic user experience starts with knowing your users, so also make a note of any unknowns that you might want to investigate. This is probably the most important question you can ask – why would someone use the service in the first place? If a service isn’t going to add value for a user then it won’t get used, it’s as simple as that. The value that a service delivers is typically in the form of something useful, but it could equally be value in the form of entertainment, such as an online game. Think about what benefits the service brings, or could bring to users and why they might recommend it to a friend or colleague. Also think about any unique selling points. What does the service provide that a user can’t just as easily get elsewhere? Channels outline the different mechanisms that users will use to access a service. Will they access the service via a website? Via a mobile app? Via a store? Which channels are users most likely to favour, and which are most cost effective from a service delivery perspective? For example, users might prefer to speak to someone on the telephone for help but is it more cost effective to deliver that help via a website? For most services you will want to think about not just the delivery channels, but also the crossover between channels. Providing a multi-channel service is increasingly becoming a ‘must have’, not just a ‘nice to have’ for any digital service. When designing a service it’s important to not just capture how a service is currently used, but also how ideally you want it to be used. By identifying desired user behaviour, you can start thinking about how the design of the service can encourage that behaviour. Also think about how frequently the service is used, or is likely to be used. For example, will it be something that users will use on a daily basis and therefore will get to know very quickly, or much less frequently? Along with users, it’s also important to identify actors and any key partners. These are all the people and organisations without which the service couldn’t be delivered. Actors might include suppliers, distributors, support staff and so on. 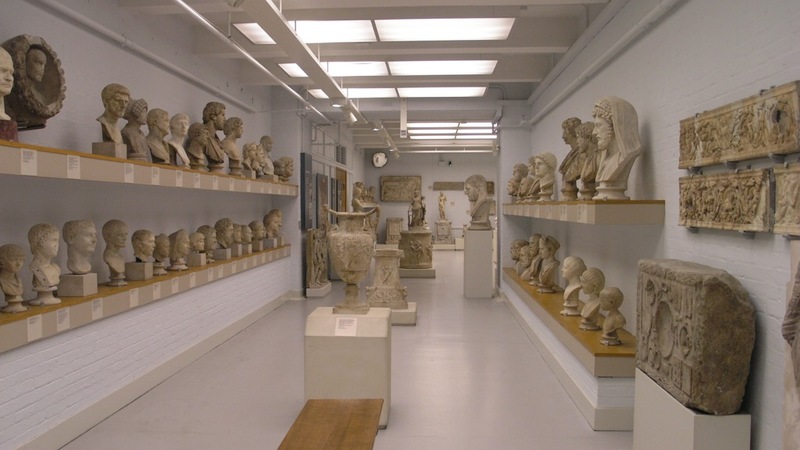 Actors might be front of office, such as sales staff, or back office, such as admin staff. For example, for an online magazine actors might include authors, the editorial team, the web team, advertisers and so on. It’s important to identify actors and partners, together with their needs and requirements because a service designed without any consideration for those delivering the service is likely to be doomed to fail from the start. Which key activities and resources are required to deliver the service? These will typically be activities that actors will need to undertake to deliver the service and resources that will be required for those activities. Going back to our online magazine example, key activities might include writing articles, editing articles, publishing content, curating comments, securing advertising slots and so on. Key resources might therefore might include a CMS system, advertisement delivery system and invoicing system. Don’t worry about listing everything that happens, or needs to happen, just outline the key activities along with the key resources required for those activities. 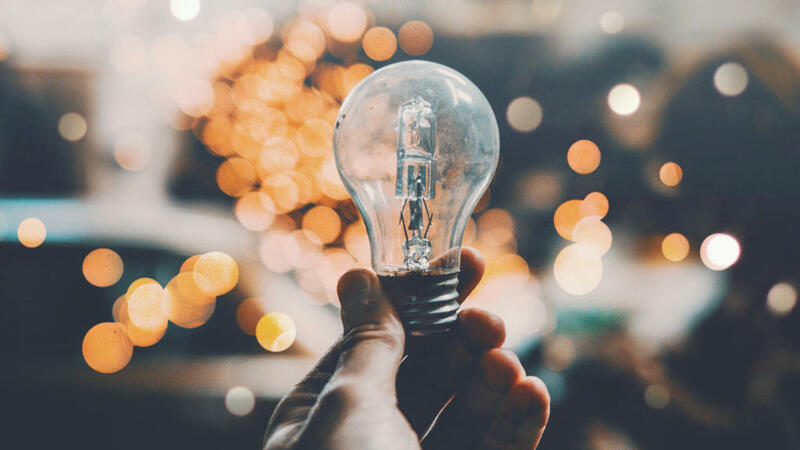 When designing a service, or indeed optimising a current service it’s important to consider any current challenges and any potential challenges. By considering challenges you can think about how the service might overcome those challenges. For example, will persuading users to actually try the service be a challenge? Will utilising the necessary technology be a challenge? Will getting users to actually pay for a service be a significant challenge? When it comes to competitors you need to think about what other choices users have. 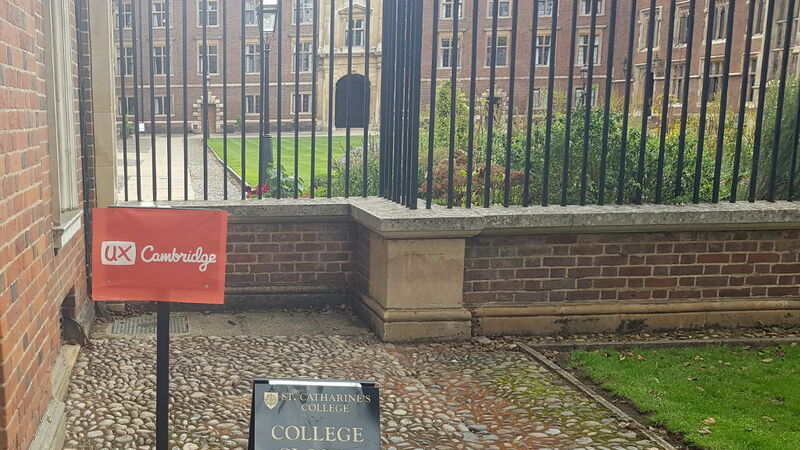 There will no doubt be other similar services, but what about different alternative options? For example, a hire car service doesn’t just have to compete with other hire car services, but also arguably public transport services as well. How does the service compare to the competition? What alternatives do users have? Why would they use your service over the competition? Any service for which the costs outweigh the benefits is never going to be viable in the long run. It’s therefore important to outline the high level key costs for delivering the service and how it’s going to deliver a return on investment. This might be a return in monetary terms, but equally could be in the form of improved customer satisfaction, brand strength, employee retention and so on. Also think about how the service delivery can be made more cost effective. For example, by encouraging user self-service, or by nudging users towards cheaper channels, such as the web. You not only need to identify how a service is going to provide a return on investment, but also how this return is going to be measured, and how the performance of the service is going to be tracked in general. KPIs (key performance indicators) could include the number of users, conversion rates, usage statistics and service net promoter score (i.e. would someone recommend the service to a friend?). Do all the boxes need to be filled in? No. If you don’t know enough about something at this stage, or don’t think that it’s relevant for the service simply leave it for now. Don’t be afraid to leave a box blank but if you find yourself making lots of assumptions then be sure to mark these (for example with a highlighter, or different colour) so that you can come back to validate the assumptions later on. Should the canvas always be filled out in the suggested order? No. The suggested order is just that, a suggestion. Feel free to fill out the canvas in the order that makes most sense to you, and your group. Why not just use the business model canvas? I felt that from a service design perspective the business model canvas is missing some key considerations, such as KPIs, usage information and risks. As its name suggests the business model canvas is focused on business models and whilst a service obviously needs to operate within a business model, there’s more to designing a service than just considering the business side of things. Who should be involved when filling out the service model canvas? Filling out the canvas is best done as a small group. An alternative can be to fill it out yourself and then go through with others, but I’ve found that starting with a group works best. 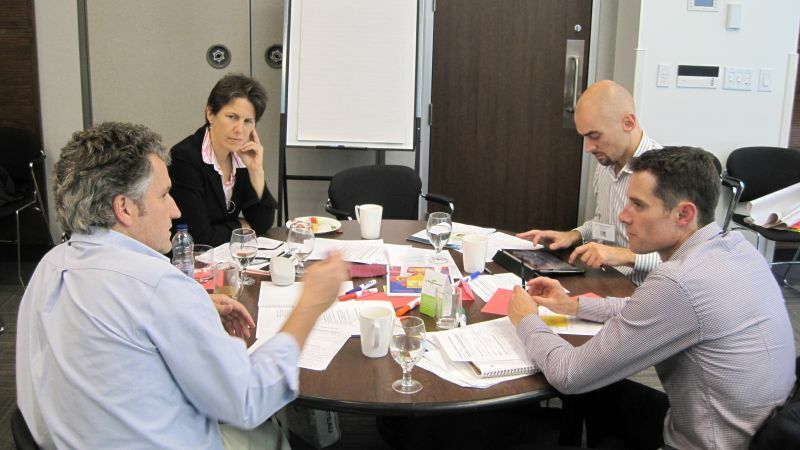 The group should ideally involve key stakeholders for the service, such as product managers, along with those that have a vested interest in the service. It’s also good to involve people with direct experience and knowledge of a service and its users, such as customer support staff and sales staff. Please note that you should use right click ‘Save as’ for downloading PNG images. Thanks for your work on this canvas. I’m an educator and I’m wondering if your work here is Creative Commons, similar to the BMC. Hi, yes I’m happy for the service model canvas to be used non-commercially as long as it’s attributed.